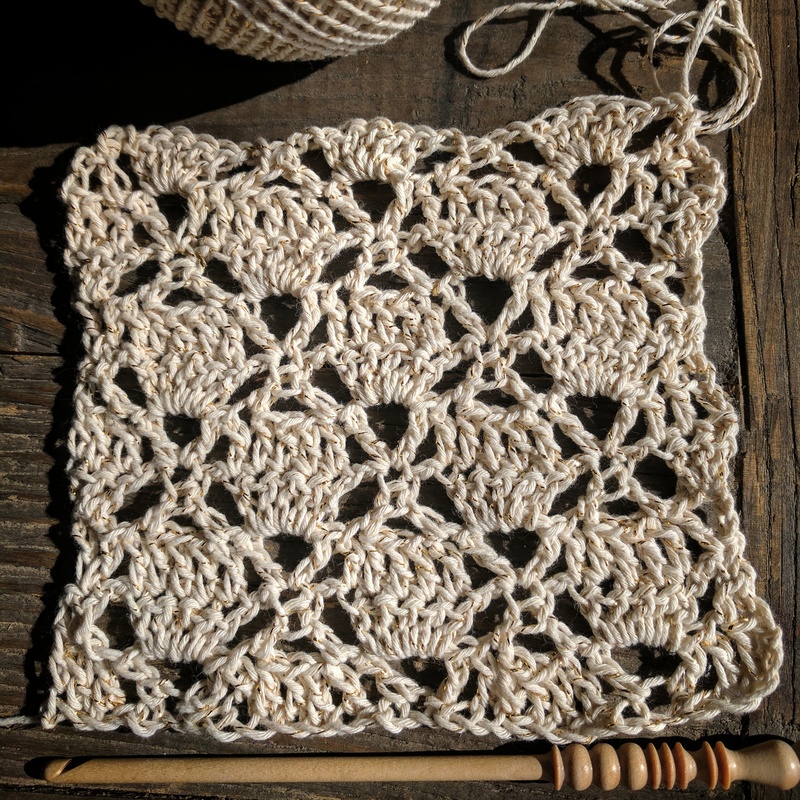 Diamond shell is a very pretty and easy stitch. It would lovely as a shawl or incorporated in a garment. Row 1: dc in 4th ch from hk, dc in next ch, sk 2 ch, v-st in next ch, *dc in next 5 ch, sk 2 ch, v-st in next ch, sk 2 ch; repeat from * across to last 3 ch, dc in last 3 ch, turn. Row 2: ch 2, sk 1st 2 dc, dc in next dc, ch 2, 5 dc in ch-3 sp, ch 2, *dc2tog over 1st and 5th dc (sk 2nd, 3rd and 4th dc) of 5-dc group, ch 2, 5 dc in ch-3 sp, ch 2; repeat from * across to last 3 dc, dc2tog over next dc and top of t-ch, turn. Row 3: ch 4 (counts as dc and ch 1), dc into top of dc2tog, dc in next 5 dc, *v-st in top of dc2tog, dc in next 5 dc; repeat from * across to last dc, [dc, ch 1, dc] in last dc, turn. Row 4: ch 3 (counts as dc), 2 dc in 1st dc, ch 2, dc2tog over 1st and 5th dc, ch 2, *5 dc in ch-3 sp, ch 2, dc2tog over 1st and 5th dc, ch 2; repeat from * across to t-ch, 3 dc in 3rd ch of t-ch, turn. Row 5: ch 3 (counts as dc), dc in next 2 dc, v-st in top of dc2tog, *dc in next 5 dc, v-st in top of dc2tog; repeat from * across to last 3 dc, dc in last 3 dc, turn. Repeat rows 2-5 to desired length.